In March 2011 when Hayley & Daniel got engaged. Jacqui and I talked to them about the type of wedding they would like, Hayley was insistent she wanted to get married on a beach, Jacqui & I were thinking of Bournemouth or Brighton, but Hayley wanted abroad. So between mid March and mid June we researched Malta and Cyprus, however they were too expensive and complicated and very pricey for guests to come over. Then in June, in the local newspaper there was a supplement on weddings and there was an advert for Sunshine Weddings Spain, we phoned them and went to see them at their office in the UK where Lisa welcomed us and made us feel really special. Lisa told us how Sunshine weddings Spain operated and answered all our questions relating to getting married in Spain, and explained the next step would be to fly over to Malaga, Costa del Sol Sothern Spain so see some wedding venues and to meet her partner, and brother, Scott who runs their wedding business from Marbella. We came away really excited and relieved that someone would take care of things for us and possibly we could make the dream wedding in Spain for Hayley. So the fun started on August 1st 2011 when we flew out to Southern Spain for 1 night. Scott met us at Malaga, Costa del Sol airport then in one hot day visited 10 different venues and by the end of our trip confirmed our wedding venue situated on the Seafront in Marbella and the date of Sunday 1st July 2012 for Hayley to marry in Spain. From that moment on I totally relaxed, a large weight had been taken off our shoulders. I was totally confident that Hayley and Daniel would now have the beach wedding abroad they’d always dreamt of. Scott was very informative and made us feel totally relaxed and listened to all our needs, providing sound advice but more importantly he was very professional. 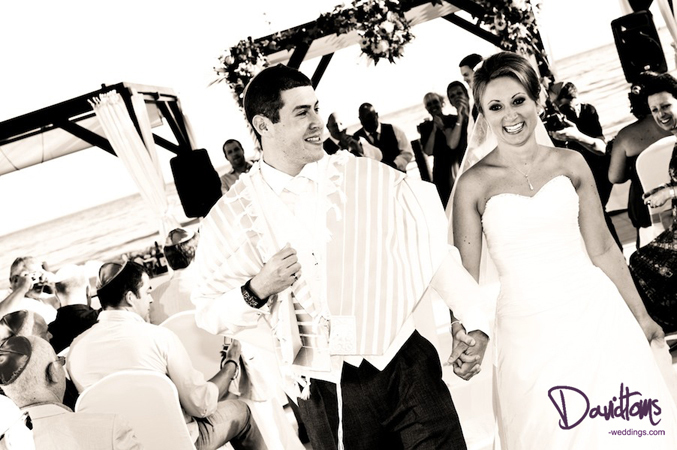 He showed us his vast knowledge of the Costa del Sol and his experience in organising weddings in Spain with a huge contact book of wedding service providers. Even though he was in Spain there was constant emails or phone calls answering any questions, the distance was not a problem. After a couple more trips to Spain to organise the rest of the wedding arrangements we finally flew out, wedding dress in hand, on June 27th for our final meeting with Scott and the venue. No words can ever describe how we all felt on that day with the ceremony on the terrace overlooking the sea, the sun shinning, dinner served at tables around the swimming pool great food and music, and of course Scott there to make sure everything went smoothly, we just enjoyed the day with no worries. So what started out in 2011 as a dream turned into reality on July 1ST 2012. Hayley and Daniel DID get their dream wedding by the beach and that will be in all our memories forever; all made possible by Scott and his team in the UK and Spain. Thank you so much to everyone at Sunshine Weddings Spain!! !